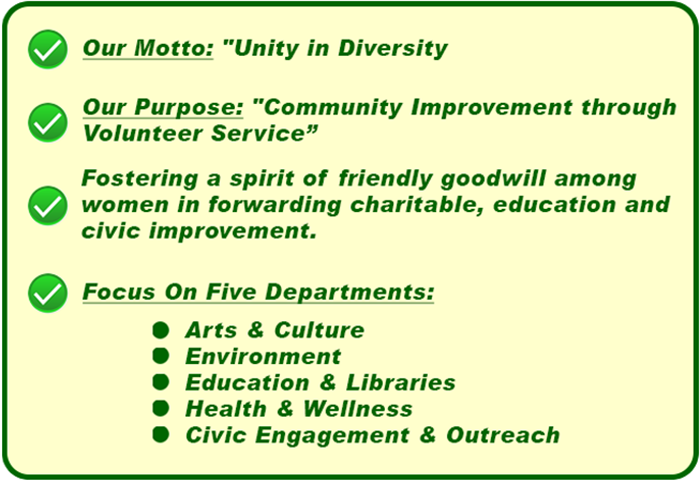 GFWC Woman’s Club of Deerfield Beach, Inc. is a charitable 50l(c)(3) organization. Proceeds from rentals, events, and donations support the Educational Endowment Education Fund (Scholarships), Education, Community Improvement, Leadership and Self-improvement of its members, and maintaining the club house. It is a 501 c-3 charitable organization. Donations are tax deductible. Keep us, oh God, from pettiness; let us be large in thought, in word, in deed. Let us be done with fault-finding and leave off self seeking. May we put away all pretense and meet each other face to face -without self-pity and without prejudice. May we be never hasty in judgment and always generous. Let us take time for all things; make us to grow calm, serene, gentle. Teach us to put into action our better impulses, straightforward and unafraid. Grant that we may realize it is the little things that create differences, that in the big things of life we are at one. And may we strive to touch and to know the great, common human heart of us all, and oh Lord God, let us forget not, to be kind!